Topics: Advance Dental Care, Real Patient Smile Makeover, Phobia Patients, New Smiles For Phobia Patients, and Cosmetic. 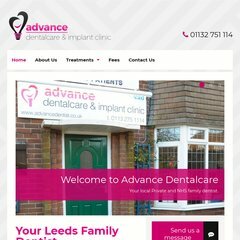 advancedentist.co.uk Leeds Dentists. Sedation Dentistry for Nervous Patients in Leeds ..
advancedentist.co.uk Leeds Implant Dentists. Yorkshire Implant Specialists. Affordable ..
advancedentist.co.uk Yorkshire Dentists. Procelain Veneers by Cosmetic Dentists in ..
advancedentist.co.uk Leeds Cosmetic Dentists. Teeth Whitening, Whiter Teeth in Leeds ..
ns2.lakesideit.co.uk, and ns1.lakesideit.co.uk are its DNS Nameservers. It is hosted by Lakeside It - Dedicated Server Ip Allocation (England, Doncaster,) using Apache/2 web server. Advancedentist.co.uk's server IP number is 85.13.197.10. PING www. (85.13.197.10) 56(84) bytes of data.